The former boyfriend and business associate of a woman killed in a bombing at an Orange County medical building told federal agents he had constructed a small explosive to help with his neighbor's "gopher problem." Stephen William Beal, 59, of Long Beach, was arrested on suspicion of being in possession of an unregistered destructive device following a search Wednesday at his home in Long Beach, California. Two completed improvised explosives devices, three firearms and parts were recovered from the home, according to a criminal complaint filed Thursday afternoon. 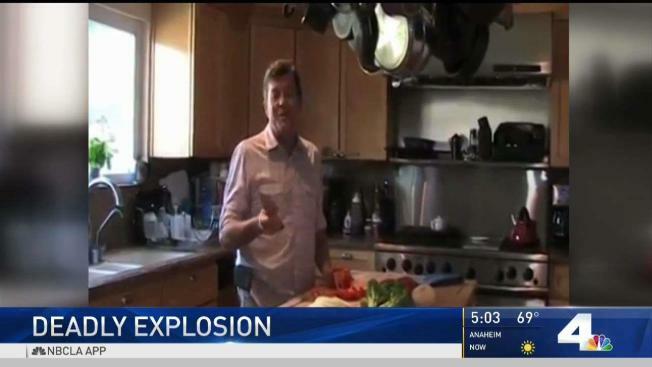 Beal is not being charged in connection with the explosion that killed Ildiko Krajnyak, 48, and injured three others at a medical building in Aliso Viejo, the FBI said Thursday in a statement. FBI agents say the explosion was likely intentional, not an accident, but they're investigating how it was carried out. The search Wednesday involving FBI agents and a bomb squad was in connection with the explosion, the FBI confirmed. "During the course of the investigation into the May 15 explosion in Aliso Viejo, investigators found a destructive device during the service of a search warrant at a Long Beach residence," the FBI said in a statement. Beal is Krajnyak's former boyfriend, court documents said. They met through an online dating app and began dating in June 2016. They opened a spa and a cosmetics products business together. Several photos on Beal's Facebook page show him with Kranjyak in Puerto Vallarta, Mexico in April when neighbors said they had stopped seeing each other. "At some point Beal's and Krajnyak's relationship began to cool due to disputes over the exclusivity of the relationship and financial issues," the criminal complaint reads. "By February or March 2018, their romatic relationship ended although they remained business partners." Beal paid about $1,500 a month in rent for the business and half of the spa's operating costs, documents said. Some months he loaned her money to cover costs. Other months, she made enough to cover the costs herself. Neighbors said that they've seen the owner of the home building large rockets in the driveway, which he launches out in the desert as a hobby. Agents also searched Krajnyak's home in Orange County's Trabuco Canyon area and the destroyed building at 11 Mareblu in Aliso Viejo. The beautician and Beal owned a day spa there called Magyar Kozmetika. "There are some components we have located at the scene that are inconsistent with what one might expect to find at this business," said Paul Delacourt, assistant director in charge of the FBI's Los Angeles field office. He said those items were being shipped to the FBI's crime lab for analysis. No arrests have been made in the bombing. If a phone interview Wednesday night, Beal's daughter said he has been a good father who would not hurt anyone. "He has always been kind, and a good friend and a good father," said Charlene Brown. "There is no way that he would do anything to hurt anyone under any circumstances."